Rise and Shine! This morning we had places to be and a lady to see! Ok so she is not actually a human lady, but nonetheless she attracts a lot of tourists. She may be the only punctual lady in the world, and if you are late, well, you might as well forget about seeing her that day. Alright, enough suspense. I am talking about Lady Knox Geyser. 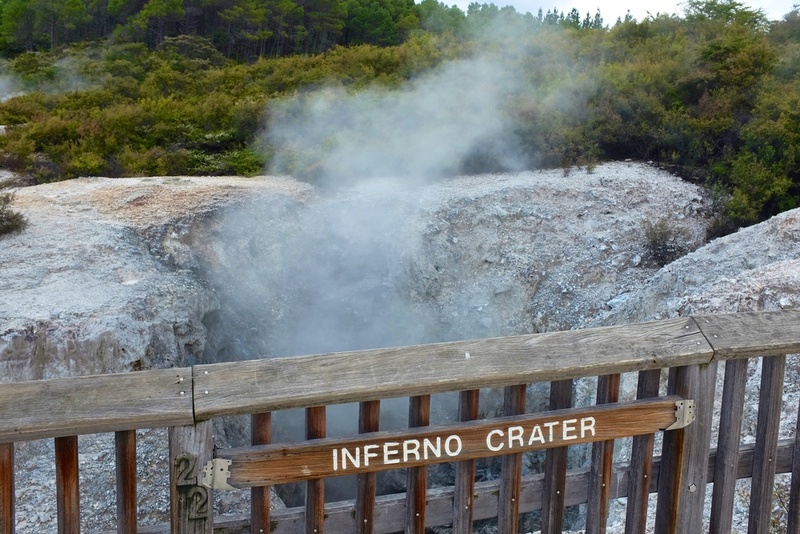 She erupts daily at 10:15 AM, and is just around the corner from the Wai-O-Tapu Thermal Wonderland. Thankfully, our tiny hotel room was practically across the street from all the fun. We found out that we had to purchase the tickets at the Thermal Wonderland ticketing center, then turn around and go back to the Lady Knox parking lot. For once, we had plenty of time and were able to find seats fairly close to the action. I was totally excited about seeing a Geyser erupt! A park ranger began the show by telling everyone a short story about how lady knox was discovered. Apparently, long ago this was an area where prisoners were sent to work, chopping wood. They discovered a clearing with a hot spring and decided to wash their cloths. Little did they know that adding soap powder to the hot spring would cause a geyser to erupt, shooting their clothes up into the air. This occured because there are two bodies of water underground with differing temperatures, and the soap powder breaks the tension of the two bodies, resulting in an eruption. The soap powder is the secret to Lady Knox's punctuality in erupting on a daily basis. She would erupt approximately every day on her own anyways without the soap, but that is not quite as predictable, and wouldn't make it as good of a tourist attraction. We were also able to put this short video together to capture the moment of eruption. Pretty cool! After seeing the eruption, we headed back to the thermal wonderland and began to explore the incredible volcanic landscape. There are 3 different paths, each with their own wonders. We decided not to skip any of them for 2 reasons: the entire thing was just 3 kms and we didn't want to miss any of it! 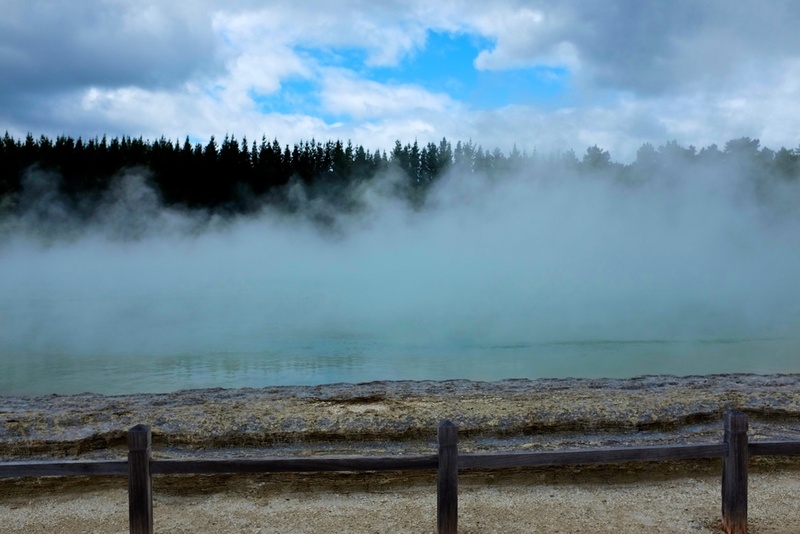 We learned quite a bit as we walked through the park, "an area of endless activity where acidic elements contained in the steam rising from an underground water system nibble away at the ground below." "Well over a dozen craters are located in close proximity. They range from 5-50 meters in diameter and are up to 20 meters deep. All were formed by the ground surface collapsing. The most recent collapse occurred in 1968. 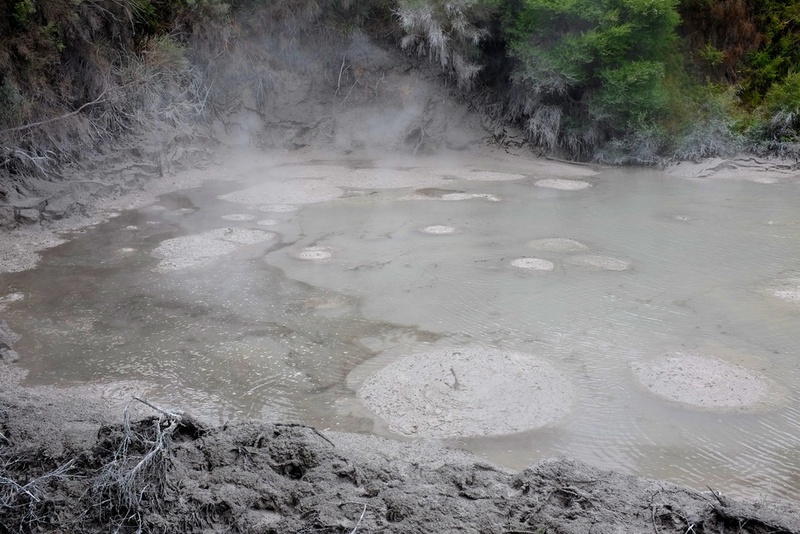 Many craters have various types of geothermal activity including steam fumaroles, sulphur vents and bubbling pools. Here water temperatures can range up to 80 degrees celcius. Colors are introduced into the area by various oxides: Purple = Manganese Oxide, Red/Brown = Iron Oxide, and Yellow = Sulphur." Ok that is a good amount of chemistry lessons, but did you catch that recurring word: sulphur? Despite the amazing landscapes that our eyes were able to feast upon, our noses would have much preferred to be elsewhere. The entire place smelled like rotten eggs, and if the wind blew in your direction you could be engulfed in rotten egg smelling steam! Mmmm....mmmm.... But don't let this discourage you, after all there is a reason they say a 'picture' is worth a thousand words and not a 'smell/scent'! This is the largest of the hot water springs at the Wai-O-Tapu Wonderland. "Earthquakes have tilted the spring, causing mineral laden water to flow over the sinter encrusted flat. This has become known as the Artist's Palette because of the trace mineral deposits that streak it's surface and are distributed based on the direction of the wind." We continued onward to the Yellow Loop. This was the part that many people skipped to make the walk shorter. "This 20-25 minute walk is through one of the most active parts of the Reserve. Visitors must stay strictly on the formed pathways and children must be supervised at all times. This part of the Reserve is unsuitable for wheelchairs and strollers. A reasonable level of fitness is required." Although the warning should not be taken lightly, this sign makes is sound like you are about to be Mario, in the Super Mario games, jumping around on platforms in a hot lava level!! It wasn't anything crazy or terrifying. There were, however, quite a few steps going down and then looping back up to see a few of the interesting landscapes. My favorite spot in the reserve was the 62 meter deep Champagne Pool. "Water enters the pool through a deep conduit at a temperature of about 230 degrees Celsius and cools within the pool to about 74 degrees Celsius with a pH of 5.4, making it slightly acidic. As the water flows over the Artist's Palette towards the sinter terraces, the temperature drops to 15 degrees Celsius and the pH level increases to 7.6, making it slightly alkaline. The gas bubbles rising to the surface are carbon dioxide, the orange color edge contains arsenic and antimony sulphur compounds rich in minerals like gold and silver." I am not quite sure why this was one of my favorite. It definitely smelled very strongly of sulphur, but the vastness of it and the amount of steam that was rising from it must have had something to do with my draw to it. The last thing we saw before leaving Thermal Wonderland was the Devil's Bath (I never did quite figure out why so many of the geothermal areas had the word 'Devil' in their name). It was a very sulphuric crater, and hence the yellowish color! It looked and smelled very unappetizing! 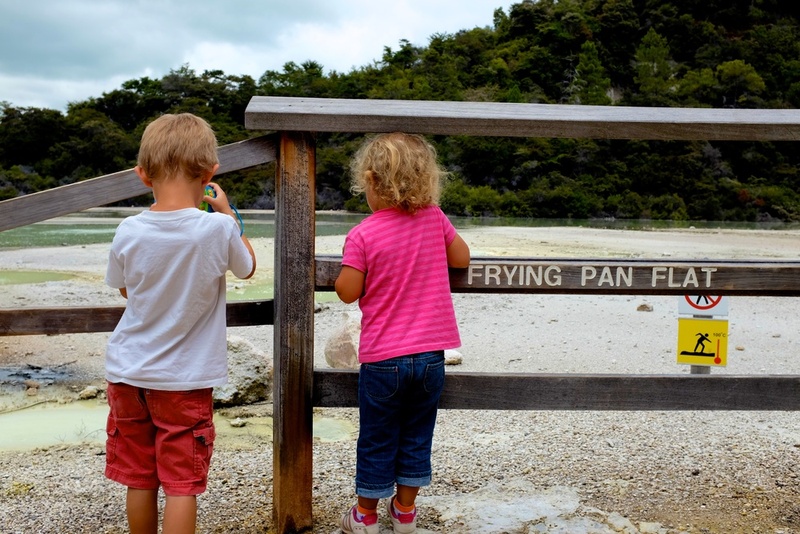 We headed out of the park with one more location in mind to visit before leaving the Wai-O-Tapu area. Similar to Lady Knox, these pools are not in the Thermal Wonderland, but they are only a short drive away. There is a parking lot with plenty of spots and the walk from there to the pools is less than a minute. 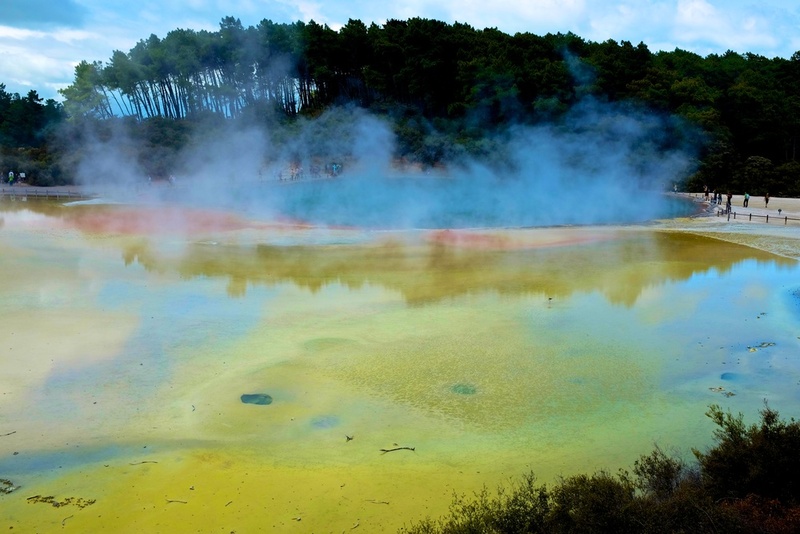 "There are two distinctive geothermal features at each end: One is pools of vents fed by deep primary geothermal fluids, the other are pools fed from steam and gas that result from boiling deep underground. These interact with geothermal fluid and ground water to form discolored pools and mudpots." Check out our video and listen to the sound of mud bubbles! That was a wrap for our adventures in the Thermal Wonderland region. We headed towards our next destination, Rotorua, where we had a nice hotel room waiting for us at the Distinction Hotel. I don't usually plug the places we stay, but we all really enjoyed staying at this hotel, and the price we got while booking in the car on the way there was great. Perhaps after a couple weeks in a camper van followed by slumming it at mediocre motels we had set the bar pretty low, but nonetheless we were all impressed. The hotel had a big pool, multiple hot tubs, and a great Japanese restaurant. But that wasn't even the exciting part for me, they had washers and dryers for hotel guests!! We happily spent the rest of our evening at the amazing hotel and headed to bed after watching the first Lord of the Rings movie with Kian (Hannah had no interest and declared that she wanted to sleep, and so she did!). The reason for watching the flick? Tomorrow after checking out Rotorua we will be heading to Hobbiton for a movie set tour! I am so excited!! I am also happy to announce Kian loved the movie, he was a trooper for all 3 and a half hours of it, and asked a million questions during the film to make sure he understood it all. Poor Elmer! We were in another tiny room and he picked an unfortunate location. He was totally in the way and ended up getting knocked down and around. We apologized, but we are pretty sure that under the circumstances bumping into our little elf was completely unintentional. See you in Rotorua Elmer!